hmmm, should we bet on how long it will take me to run out of Devo lyrics for WiP it Wednesdays? Top Left – Minimalist Cardigan , I’m working the on the last sleeve! I am so close to being done, I just haven’t had much knitting time. I have to say I”m not looking forward to the seaming, I’ve never seamed anything before and I’m worried it wont go well and what would be a nice sweater will look awful because of the seaming. Top Right – The Chicabean Scarf, its for my sister, she picked out the yarn herself last year and I had a hell of a time deciding on a pattern for it. I finally did. I know you can’t see it well in the picture but it’s a sort of a surprise, not the scarf or the yarn, but the FO. So you just get a peak. Middle Left My Picovoli , I haven’t done much with this one either. 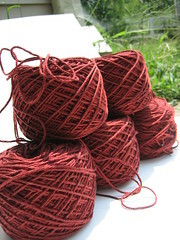 I think it will be my travel knitting this weekend. Yep I’m going out of town, but don’t worry Yarn Pr0n Friday will still post and I have a few other things, but I wont be responding to comments until I get back. Middle Right – I haven’t touched the Simple Throw. It’s too hot for an acrylic blanket on my lap right now and I keep telling myself there is plenty of time until Christmas! 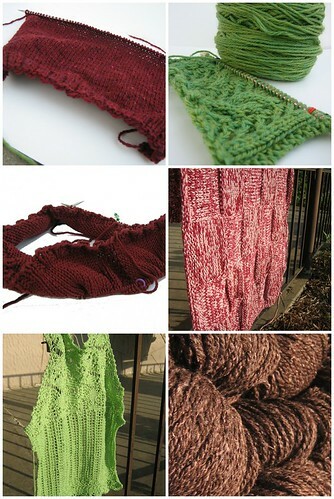 Bottom Left – The Lace Tank is still on hold because I’m still using to my Size 6 needles for the Mini Cardi. But I’m almost done with that and I’m itching to finish this one so hopefully I’ll get it done so I can wear it a few times before it gets too cold for it. Bottom Right – That’s the yarn I thought was going to be the Tangled Yoke Cardigan but I decided I don’t want another cardigan right now so it’s be reassigned to Salina . 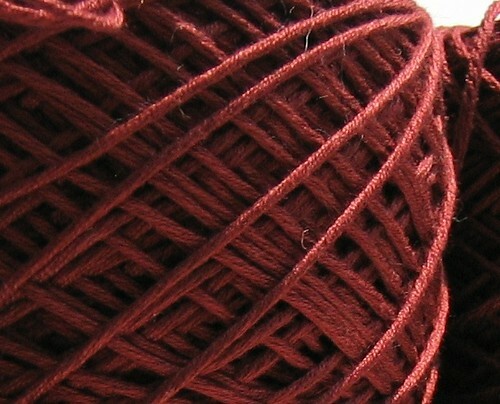 I swatched and it will be my next project. 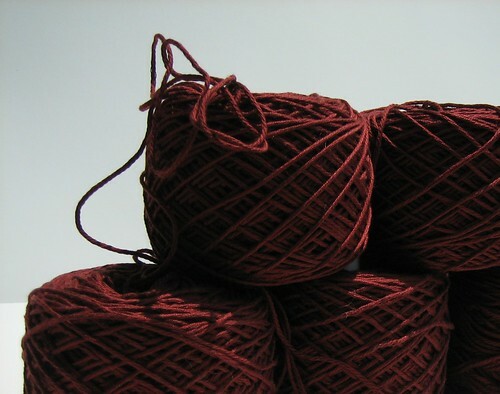 I love this color (even though it’s not green) and the yarn is knitting up nicely. I have 5 more balls in mauvish pink color.